The BBC's weekly The Boss series profiles a different business leader from around the world. This week we spoke to Romana Abdin, chief executive of private healthcare provider Simplyhealth. Romana Abdin was just three when she contracted polio, but she says she "was one of the lucky ones". But Ms Abdin says it could have been much worse: "Lives have been lost through polio." "It probably helps me think about the fact that health is not about being fully fit and perfect," she says. "It is about living with health challenges, and making the most of it." 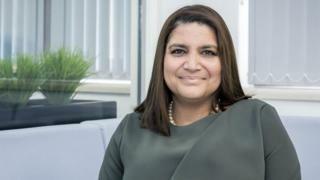 As the UK's National Health Service continues to celebrate its 70th birthday, Ms Abdin - the daughter of an NHS doctor - says there will always also be a place for the private sector in healthcare provision. Although Ms Abdin says she "toyed" with the idea of joining the medical profession during her teens, she decided to go into law instead. In 1991 she joined the legal department of the Bradford & Bingley building society, but the busy lifestyle didn't suit family life. "I had two small children, and there was a moment when I was up and down motorways and hearing my daughter read over the mobile phone and I thought: 'There's more to life than this'. She says that she "fell in love with the organisation and its purpose". After 12 years Ms Abdin was asked if she'd like to become chief executive, but she didn't immediately say yes. "I was almost going 'I'm not sure I'm the right person, why should anyone follow me?'. "I was asking: 'Do I have the skills to go with this role? ', which is typically what women do." Simplyhealth today has 3.4 million active users who pay a monthly fee to help cover costs such as private health checks, dental treatment, physiotherapy, and hospital stays. "I think the idea of universal healthcare is amazing, but the idea was never intended to be comprehensive," says Ms Abdin. That's a quote that the NHS's founder Aneurin Bevan would likely strongly object to, but Ms Abdin says that people need to take some personal "responsibility". She adds: "I believe if the NHS is to continue servicing people in acute moments, every single one of us needs to take responsibility, and organisations [like Simplyhealth] are best placed [to help]." In terms of Simplyheath's financial performance, Ms Abdin has to turn things around after a difficult 2017. Ms Abdin says that this loss was the result of costs associated with the closure of subsidiary retail business The Unlimited Company, which sold a range of mobility and home assistance products - from mobility scooters to wheelchairs, and kitchens and bathrooms designed for disabled people. Image caption With the NHS providing free-at-the-point-of-delivery care, how do you persuade people to pay for private healthcare? Patricia Davies, a health insurance expert at research group Global Data, says that challenge for private healthcare providers in the UK would always remain the same - how to persuade businesses and members of the public to buy cover "when we have the NHS". Asked how her colleagues would describe her, Ms Abdin responds: "Challenging, disruptive, energetic and loud. "I'm loud - leadership is about energy. I think the other thing is to say I'm passionate about developing people. I love to see people grow." "Steps become a problem, and walking is difficult, but it has never stopped me doing anything I wanted," she says. She adds that once a month she visits a charity "which is focused on helping people with mobility problems remain active". "I use machinery that works with you and assists you to move, for example a rowing machine that you press against. I go once a month - I'm trying to get to a place where I'm going every week."